In the journey of seeking new spices in the central of Viet Nam, The Golden Spoon crew had visited chef lead of team 76 – Crowne Plaza Danang team – chef Le Van Tuong. He is living in coastal area Duy Hai town, Duy Xuyen, Quang Nam province. The crew decided to film right at that area because cactus ingredients, which team 76’s chefs brought to the Northern semi-final round, were so impressive. The cactus from central sandy soil – team 76. Inspired by mom’s food at home, team 76’s chefs had created a great Golden Dishes menu and won the Northern semi-final round to go straight to the last competition. Their Golden Dishes were: 1) Cactus salad – Japanese scallop served with fish bladder, pincers, and sauce of pumpkin seeds; 2) Star fruit soup and fresh water eel; 3) Five-spice sautéed duck breast served with cochinchin gourd rice and vegetables; and 4) 3 layers lemon cold cake served with cactus fruit sauce. 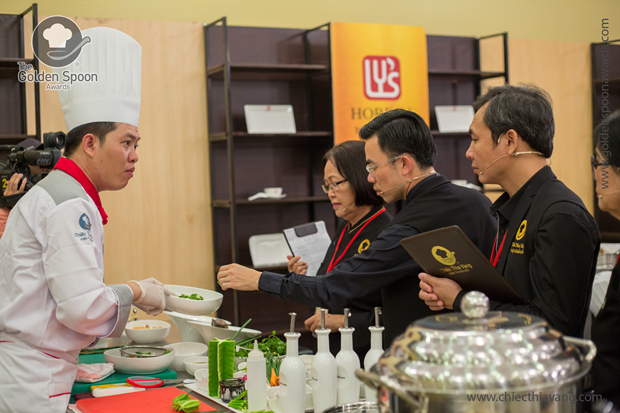 Chef Dinh Duy Binh shared with the jury about usages of cactus. 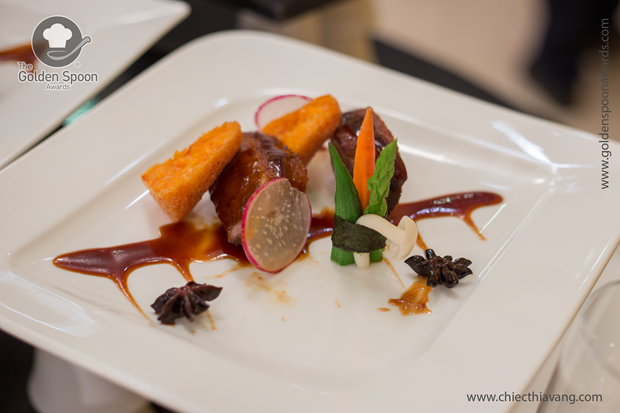 Chef Dinh Duy Binh shared, “I didn’t know that cactus is edible until chef Le Van Tuong’s mom said so. Our people here had had those cactus to survive during the war and harsh periods.” From that story, we looked up from the Internet and saw that cactus could be eaten raw or cooked. 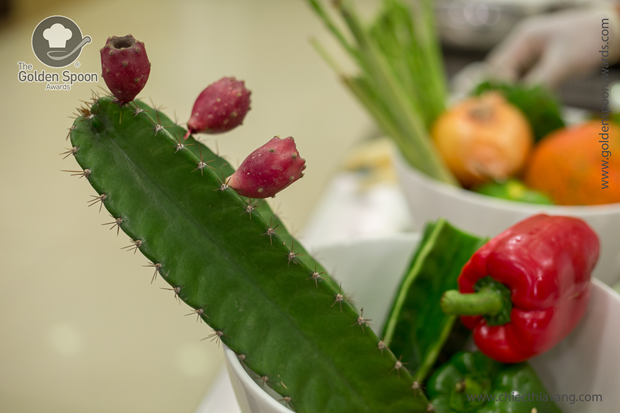 Chefs around the world seem to favor cactus not only because of its interesting sour and sweet taste but also because it’s really good for health. Cactus basically can heal and treat some common sickness, such as backache, diabetes, spine-ache, or high blood pressure. Liquid extract from cactus branches contains antibiotic, which can apply for dermatological problems, edema, or rheumatism while decoction from cactus branches can work with gout. 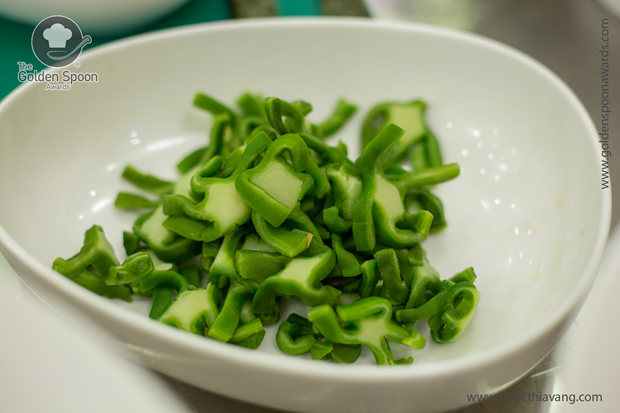 Cactus was cooked into healthy and nourishing dishes. Team 76 chose the best 5-edge cactus fruits, or so called “dragon spines”. Chef Binh said that it’s really hard to deal with cactus because it has bitter taste, sap, and even poison. They took off cactus fruits’ stalks, peeled the chiffon layers off, and blanched bare fruits in boiled water with a pinch of salt to eliminate bitterness; blanched fruits would be soaked in lime ice then squeezed to eliminate sap. Salt and lime could subtract the fruits’ bitterness and poison. Party table of Crowne Plaza Danang hotel team. Sea crabs were chosen to be in the salad because of their nutrition, which contains Calcium, Maggie, and Omega-3. Sea crabs are evaluated as one of ideal food, which contains high minerals and protein, to maintain stable cardiovascular activities. The impression of that appetizer was that sea crabs combined with aromatic nutty creamy pumpkin seeds and crispy flour and egg outer layer. 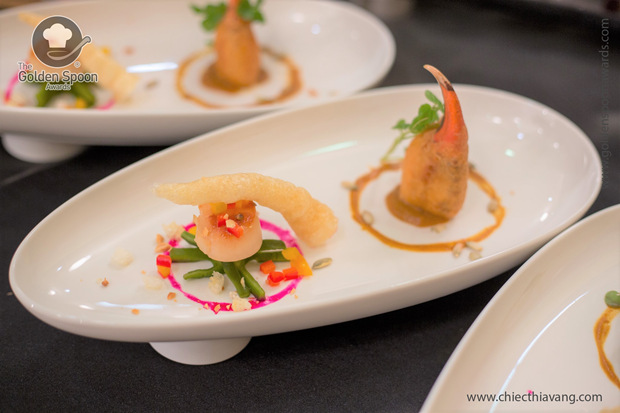 Cactus fruits salad – Japanese scallop served with fish bladder, pincers, and sauce of pumpkin seeds. Properly that was the only team that used pumpkin seeds for the sauce. “Usually pumpkin seeds are wasted or roasted as melon seeds for snacks. People tend to use peanuts, mayonnaise, or fruits but not pumpkin seeds for sauces. I did some researches and have known that those seeds are really tasty and healthy so I wanna give it a try. Pumpkin seeds were roasted, shelled off, grinded then relished with other spices”, shared the leaf chef. 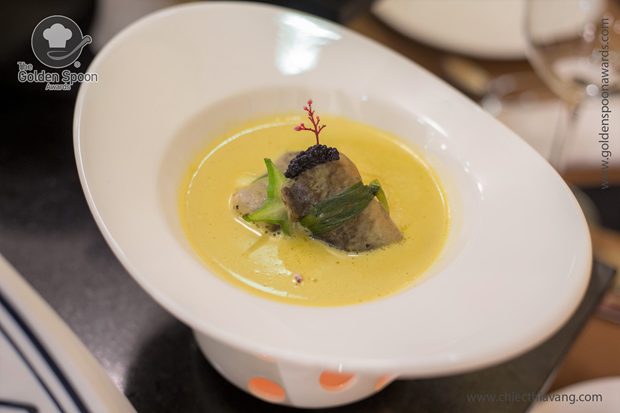 Another memorable dish in the menu was star fruit soup with fresh water eel, which carried featured flavors of Quang Nam province. They made a trial for colleagues before bringing it to the contest and it got full of complimentary. Being inspired from Thang Binh fish sour soup, they decided to use all natural tastes of star fruits without any additives. Star fruit soup with fresh water eels. Star fruits carry both sweet and sour tastes and they are supposed to have plenty of good effects on human body. They also contain 1% oxalic acid and bunch of micronutrients as Calcium, Iron, Sodium, and vitamins K, A, C, B1, B2, and P. For years, star fruits have been world wide used for sunburn, coughing, fever, sore throat, and even Eczema. Star fruit leaves are also used to treat peptic ulcer, pyoderma, ulcers, and to improve digestion problems. Star fruit flowers are used for coughing treatment, especially on children. The fruits contain an antimicrobial agent that can fight bacteria such as Microbial bacillus cereus, E. coli, or Salmonella typhus. Five-spice sautéed duck breast served with cochinchin gourd rice and vegetables. The team skillfully applied international flavors into the main dish - Five-spice sautéed duck breast served with cochinchin gourd rice and vegetables. 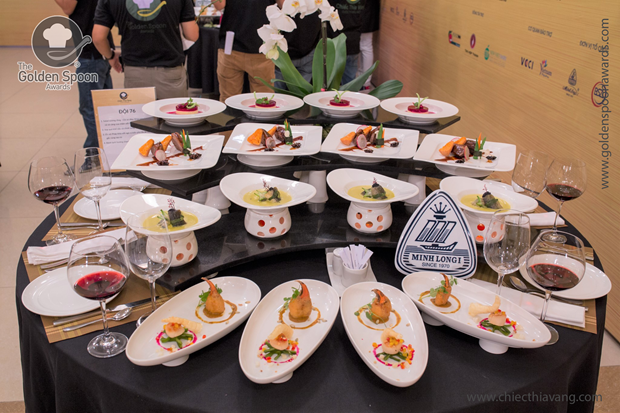 There were rice of Asia, cheese from Europe, five spices of China but the summit was the very Viet Nam cochinchin gourd. Another point of the dish lied in the sauce, which was cooked with duck feet – a featured ingredient of the Central to alternate thickener. Besides, they used sous vide technique to keep duck breasts’ tenderness and sweetness. Eye-catching dessert: 3 layers lemon cold cake served with cactus fruit sauce. Cactus fruits had started the stage and now they used it to close with the dessert: 3 layers lemon cold cake served with cactus fruit sauce. 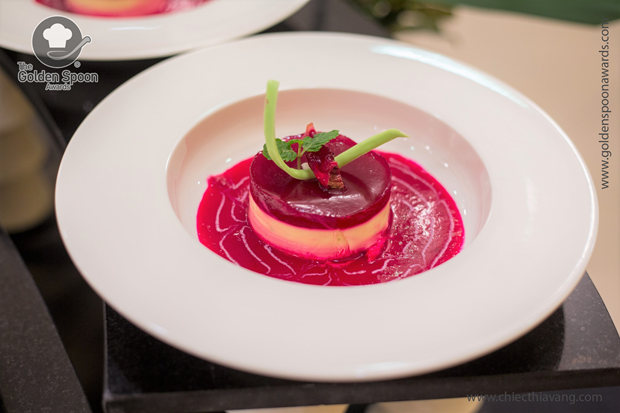 The team announced that they were preparing for the final round and at the same time, bringing new dishes from the semi-final round to business at Crown Plaza Danang restaurant.